Polish author; born at Warsaw 1868. Since 1886 he has published the following works, in which he advocates theassimilation of the Jews with the people among whom they dwell: "Assimilatarzy, Sjonisci i Polaci"; "O Zargonie Zydowskim"; "Stasunek Mickiewicza do Zydow"; "Kosciuszko"; and "Berek Joselowicz." He acted as secretary of the Baron de Hirsch Fund at Cracow (1891-94), devoted himself to public affairs, and took part in forming the Galician Radical Progressive party. He was one of the founders of "Ognisko," a journal for the progressive Polish youth. 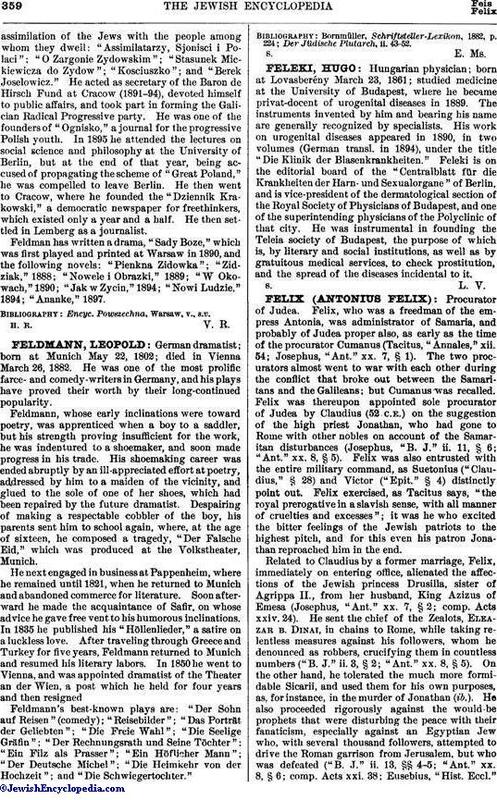 In 1895 he attended the lectures on social science and philosophy at the University of Berlin, but at the end of that year, being accused of propagating the scheme of "Great Poland," he was compelled to leave Berlin. He then went to Cracow, where he founded the "Dziennik Krakowski," a democratic newspaper for freethinkers, which existed only a year and a half. He then settled in Lemberg as a journalist. 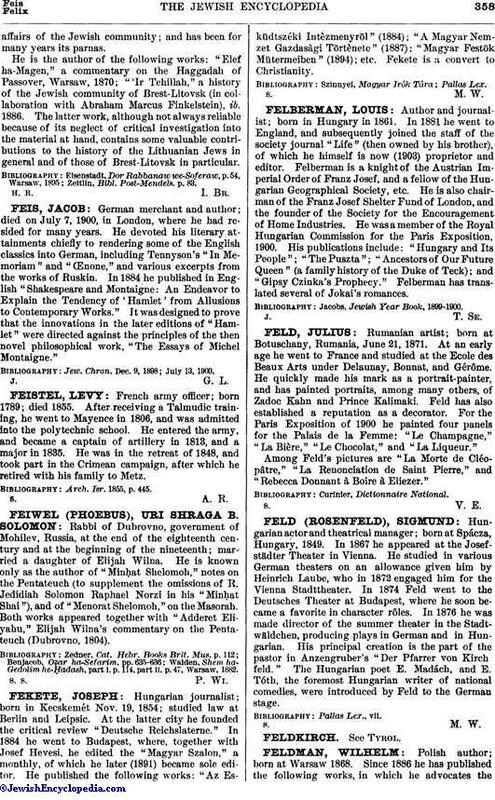 Feldman has written a drama, "Sady Boze," which was first played and printed at Warsaw in 1890, and the following novels: "Pienkna Zidowka"; "Zidziak," 1888; "Nowele i Obrazki," 1889; "W Okowach," 1890; "Jak w Zycin," 1894; "Nowi Ludzie," 1894; "Ananke," 1897. Encyc. Powszechna, Warsaw, v., s.v.